Motorists have been experiencing significant delays on the M61 as snow chaos continues to affect drivers across the North West. 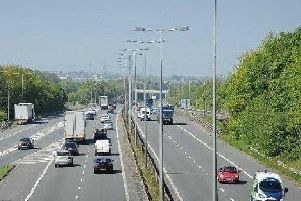 Traffic on the southbound carriageway from junction nine for Clayton Brook at the M65 interchange to junction eight for Chorley was being significantly held up, with a spokesman for Highways England reporting an average speed of 14 mph for southbound traffic. They added that "there are no specific incidents that we are aware of however weather is slowing traffic down". But this was followed up by news of a one lane closure due to an accident on the southbound carriageway, with lane one of three closed while vehicles involved are recovered. Traffic was held traffic between 7.50am and 8.15am to deal with the incident. An AA spokesman said that there are "severe delays of 36 minutes" with "delays increasing". Motorists were also been seen getting out of their cars to try and gain a better understanding of what is causing the long delays.